November turned out to be a very busy and productive month for me personally. I accomplished two big personal goals that I had set for myself. An idea for a book had been percolating in my mind for years, but I had never written it. I had started to write the book on previous occasions, but didn’t get much done and never finished. As November approached I decided to finally start and finish the novel. Why November? 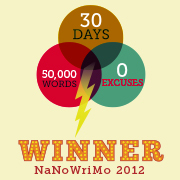 Because November is National Novel Writing Month according to the NaNoWriMo web page. This web page encourages people to write a 50,000 word work of any genre during November. The web page offers encouragement, advice and motivation. It facilitates communication with others attempting the same goal. The web page helps you keep track of your words as you move towards your goal, and suggests that you not get sidetracked editing the work you did last week, but instead bang out the 1,667 words per day you need to get to 50,000 in a month. It also helped that there were about six other Peace Corps Volunteers giving it a try as well. I even created a web page so the six of us could compare our progress as the weeks of November went by. I would write at home and sometimes at my office. It really didn’t take all that long to write the book. In fact, it almost seemed to write itself. As I said, the general outline of the story was already formed in my imagination; I just had to get it down on paper. I wrote every day and ended up getting to 50,000 words by around the 20th of November. There were times that I would get stuck, and struggle with the plot or a character, but I would often think those problems through on my morning bike ride. The book ended up being about 54,500 words and I am still tweaking and editing it little by little. I am proud of finally writing the book I had always wanted to. This success shows me that if I ever want to write another book, I can do it. Just landed and just finished the entire thing. I loved it! Very exciting and kept me interested the whole way through. Again, keeping me interested enough to read an entire book in one sitting is quite an accomplishment. In fact, I don’t think I’ve ever done that. Tish hasn’t read it yet. She knows I am still editing it and wants to wait and read a more finished form of the novel. What will I do with it? I have no idea. I know next to nothing about how to get a book published, and I don’t have illusions of becoming the next John Grisham. The bottom line is this: I set a goal for myself to write a novel of at least 50,000 words and I did it. Riding my bike is one of my outlets here for stress relief. I also ride for the sheer fun of it and also to stay fit. I sometimes ride with others during the weekend, but in November, all the riding was by myself. I started upping my cycling mileage in August. I started riding more consistently and I changed my daily ride to 25 miles. I rode 702 miles that month. I keep very detailed records of my exercise going back about 15 years. This includes the years when I was competing on my road bike around the country in duathlons as a member of the USA Triathlon (USAT) organization. I went back and examined those records to see how my 702 mile month compared. I was surprised to discover that my highest mileage for any month back when I was competing was 680 miles. I was putting in more mileage in Botswana than I ever had before. I started wondering if a 1,000 mile month was possible. It wouldn’t happen in September or October when many cycling days were traded off for vacation days as David and Betsy and their significant others came to visit. I decided try for 1,000 miles in November. I would have to increase my mileage to about 40 miles per day. It would mean a significant increase in my daily and monthly mileage. During the month, I would start my ride very early in the morning, often just before sunrise. Many mornings I started before 5:00 am. The earliest I set out was 4:42 am. I couldn’t start too early or it wouldn’t be able to see (and be seen). I would try to head out just before the sun had risen over the horizon. At that time there was just enough light in the sky to see. Getting an early start meant that I could be finished, bathed and working by 9 or 9:30 am. Another reason for the early start was to not be riding when the temperature rose. In November the high is often in the high 90’s (Fahrenheit). That early the temperature would be in the high 60’s to mid 70’s (Fahrenheit). Riding my usual 40 mile route takes around 2:30 to 2:50, depending on how strong I felt that day or if there were headwinds to contend with. 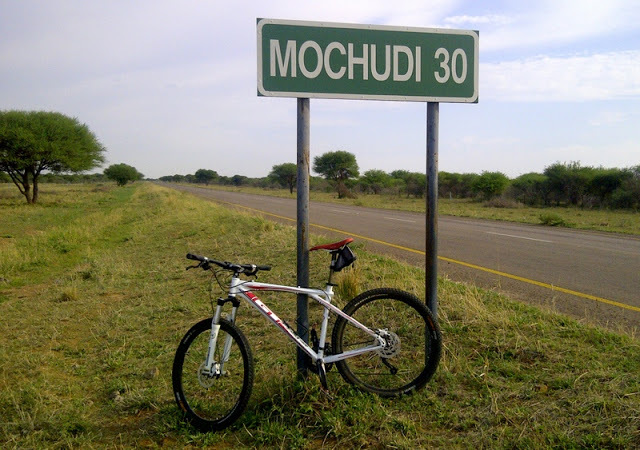 The route itself is just an out and back route from Mochudi toward Sikwane. The road has a generous shoulder and not much traffic, so I feel very safe riding there. Also, I have some nice music to listen to thanks to David, who left his IPod for me when his vacation ended. 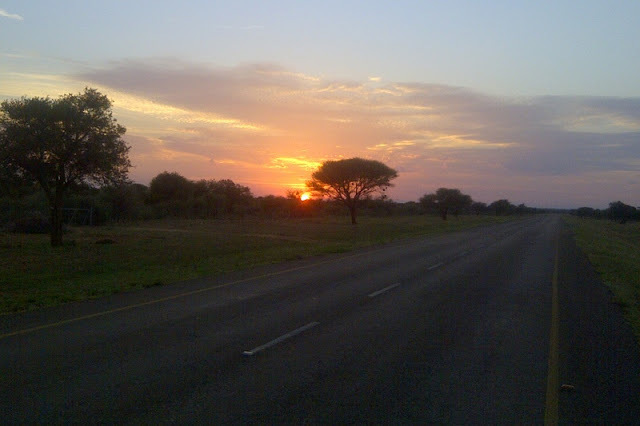 The ever present sunshine of Botswana helped me be successful. It rarely rains here, even in the “rainy season”. Almost every day is a good day for riding. Also, my flexible schedule as a Peace Corps Volunteer helped. The only time I thought I might not meet my goal was during the middle of the month when I suffered from a particularly nasty saddle sore (too much information?) Nurse Tish helped me by giving me some sound medical advice, and I suffered through and rode with it until it resolved itself about a week later. On November 28th, at around 6:00 am, the 16th mile of my 40 mile ride put my monthly total at 1,000 miles. I had met my goal. The day after I had met my goal, I intended to give myself the day off as a reward. I woke early out of habit and decided to go riding instead of resting. I didn’t need to ride — I had met my goal. I went out and did my 40 mile route just for the fun of it. I absolutely love riding in the mornings here in Botswana — so why take a day off? My normal route takes me in an easterly direction directly into the sunrise and the sky is spectacular. Even though it gets hot here, in the mornings it is wonderful. The clean cool air feels like silk. At the end of November my total mileage was 1,106. The bottom line is this: I set a goal to ride 1,000 miles in a single month. I achieved it and am proud of myself. Note: November wasn’t all about me. It was a good month for Tish as well. In November, she planned, organized and executed a very successful Peace Corps project. It was a huge struggle for Tish to make this happen and was a huge success. That is all Tish will allow me to say here, as she wants to write a post about it herself. Stay tuned for that. This entry was posted in Cycling, Peace Corps, Service - Year 2 and tagged cycling, Mobley, National Novel Writing Month, Writing. Bookmark the permalink. Way to go, Marion. Talk to Peyton about how to get a book published. She had to do that in college as a part of her graduation from Senior Project. She wrote a novel and followed the protocol to get it published. Alas, it did not go anywhere but she also went to culinary school so that changed things. Really proud of you and all you have accomplished. We are missing you both.